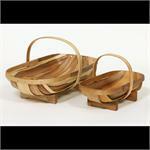 This Trug is perfect for a fruit and veggies countertop or table basket. Serve bread or rolls in it or give a gift of wine in this versatile basket. A wonderful harvest basket in the garden for berries, peas, herbs!